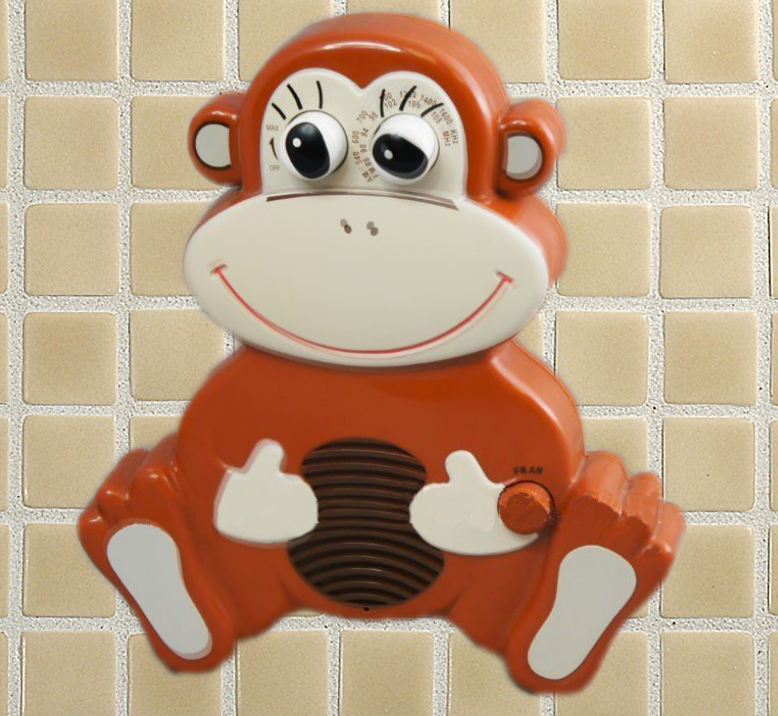 Years ago, I had a water-resistant radio shaped like a monkey that hung in the shower. Its blasts of news and music got me going in the morning as much as the hot water did. My apartment neighbors probably loved it, too. The waterlogged plastic monkey eventually stopped working. And shower radios have come a long way since then. Now, instead of speakers that play terrestrial radio, there are water-resistant Bluetooth speakers that play music and other audio from apps on your iPhone, Android or tablet. Some of the speakers even patch your phone calls through, in case you’re kind of a big deal and can’t possibly miss a phone call while you’re showering. 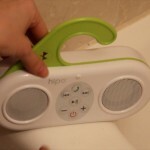 The three speakers I’ve been testing recently are the Hipe shower speaker, from a company of the same name; the iShower speaker from iDevice; and Ion’s new Sound Splash speaker. All are compatible with both iPhone and Android mobile devices. They range in price from $50 to $100, and are available through each company’s website and a variety of online retailers, including Amazon.com. Speaking of Amazon, a search on the site for “shower speakers” brings up more than 350 results, some as cheap as $20 and others costing close to $500. Home goods stores like Bed Bath & Beyond carry these products, too. And Kohler recently introduced a $200 showerhead that is Bluetooth-equipped and plays music from mobile devices (although, if your apartment has the fine architectural design mine does — known as “just a rental” — you might not want to make such an investment). So, shower radios and speakers aren’t hard to find; these are just a few relatively new ones. After a week and a half of many showers and prune-y skin, the $100 iShower emerged as my favorite. 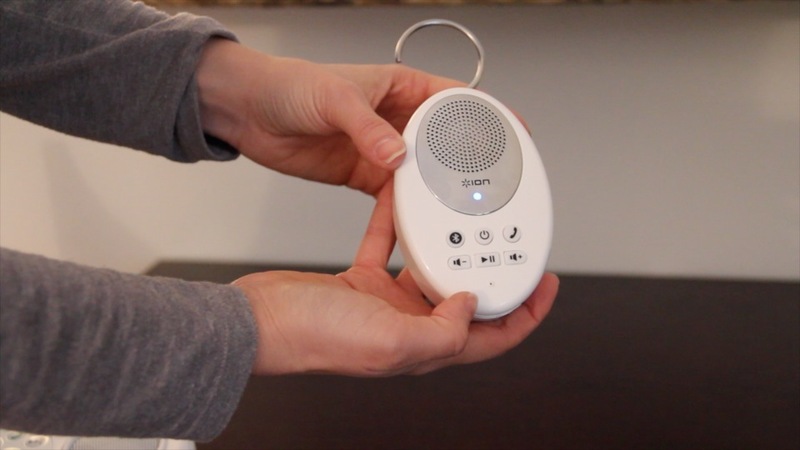 It feels solid, has an intuitive user interface and offers good sound. However, it’s also the priciest and heaviest of the three, and is the only one that doesn’t patch phone calls through. The $70 Hipe speaker also gives good sound, but has an awkward shape with a cheap, immovable arm and it doesn’t have a designated Bluetooth button. And while the small, $50, egg-shaped Ion Sound Splash is great for travel, its sound just doesn’t have enough oomph for me. But keep in mind that these aren’t offering superb sound or dynamic range or other features you might look for with fancier speakers. Their best attribute is that they’re water-resistant and can withstand the moisture around them. Let’s start with the iShower, which is compatible with iPhone, Android phones and BlackBerry. This mostly-white rectangular speaker is about the size of a paperback book, measuring four inches by 1.1 inches by six inches and weighing 12.6 ounces. The iShower has a skinny rectangular arm that extends from the back, for hanging the speaker. It kept sliding down my showerhead, so I opted to stand the iShower on a shower shelf instead. The iShower has a tiny Bluetooth button on the upper-left-hand corner of its face, but pairing up requires that you press the Play/Pause button, as well. The speaker has helpful blue LED lights that say Hi, Pair, GoodBye, and show the time of day — good for those who like to linger in the shower. My original shower radio. 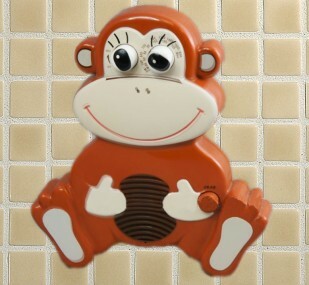 RIP shower monkey. I played and skipped through multiple MP3 song tracks from my iPhone on the iShower, as well as music from the Pandora radio app. (In all tests, my Bluetooth-paired iPhone was safe from water on my sink, just six inches away.) The music sounded okay. It didn’t sound like it might be coming from a high-end speaker, but it wasn’t distorted or echoey, either. The iShower’s speaker is actually in the back of the device, but it sounded good even when pressed flat against the shower wall. In addition to lacking the phone-call feature, the iShower is also the only speaker I used that requires three AA batteries — which are a pain to buy and replace. 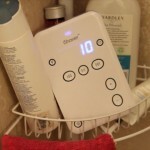 The batteries should last around 15 to 16 hours, iShower says. Before using the $70 Hipe speaker, I had to charge its built-in battery for a few hours. A representative for Hipe declined to say exactly how long the speaker’s rechargeable battery should last, except to say it should go for “several hours.” In my experience, the Hipe didn’t need to be recharged, but I was only using it intermittently for a week. The Hipe is really lightweight but, due to its shape, it just didn’t fit well in my shower. Its lime-green curved plastic handle isn’t adjustable. And the speaker body, which looks like a mini-boombox, was too oblong to fit on my shower shelves. So I rested the speaker on the edge of the tub. Also, the Bluetooth pairing for this speaker wasn’t super intuitive. You’re supposed to hold down the power button for an extended period of time after the speaker has powered on, and wait for LED lights to alert you to pairing mode. A dedicated Bluetooth button would be helpful on this one. 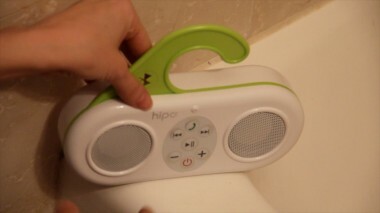 But the Hipe, with its wider body, has speakers on either end and can get pretty loud for its size. Of the three, it offered the most amplified sound, allowing me to really hear my music and and news over the hiss of the shower. Unlike the Hipe, the $50 Ion Sound Splash, which looks like an egg-shaped hockey puck, can pretty much fit anywhere. It has a slim metal hook that I much preferred to the plastic arm of the Hipe. And since the Sound Splash is so light, you can also use the accompanying suction cups to hang it from the wall. It has a rechargeable battery that should last for eight to 10 hours. However, the Sound Splash’s sound was weak in the shower. I kept trying to jack up the volume, and eventually had to hop out of the shower, dry off my hands and max out the volume on my iPhone to get the sound to a decent level. The Sound Splash also doesn’t have buttons for skipping through song tracks, so I had to do that directly from the iPhone, as well. The Sound Splash is probably a much better option for the beach, where you don’t necessarily want to disturb your neighbors with loud music, or even by the kitchen sink, to break up the monotony of cleaning dishes. But it wasn’t powerful enough for the shower. If you’re willing to spend a little more for a shower speaker, I’d go with the iShower.